I know many of you will cringe when you see bitter gourd (I can literally see my sister making the puking face already! Hohoho…). But, I also know many out there who love this unique melon despite it’s bitter taste. I remember mum use to utter these Chinese saying, “If you can eat bitter food, you can withstand bitterness in life…” whenever she try to force us to eat bitter gourd when we were young. Interestingly, I grew up loving it. Thankfully, hubby likes bitter gourd too!!! I love drinking Chinese soup – especially bitter gourd soup. 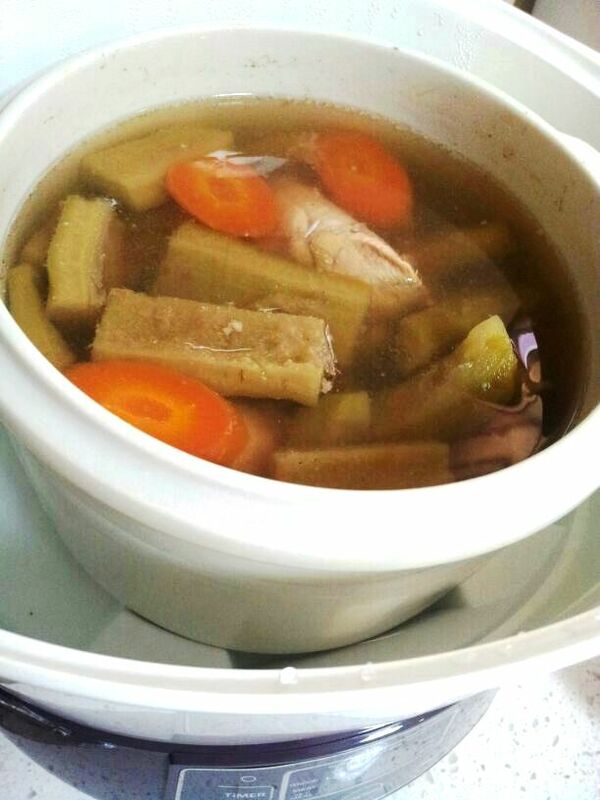 Mum always make sure we have soup daily during our schooling days. How I miss those days. 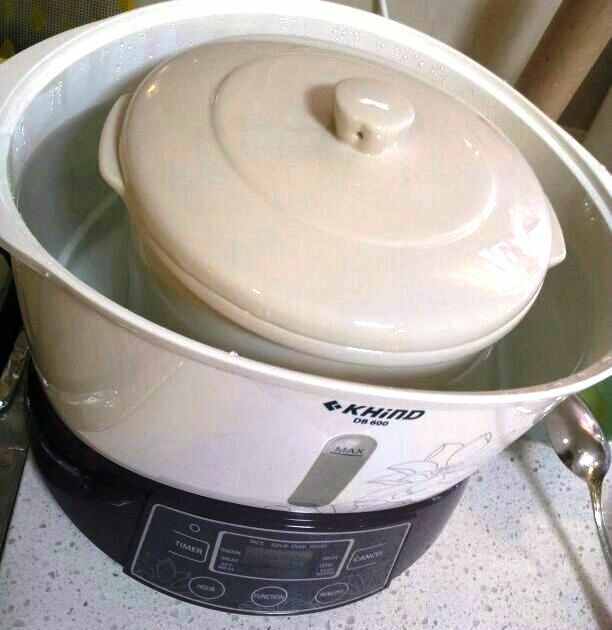 Unfortunately, it’s really tough to make Chinese soup sometimes because it usually means at least 5-6 hours of boiling and keeping a close eye on the pot (making sure the water don’t dry up or water splatter out from the pot). I’m lazy and working from morning to night means that it’s not easy to enjoy Chinese soup at home. When I get desperate, I’ll usually drop by one of those double boiling soup restaurants. But, nothing beats home cook Chinese soup. Finally, after living on our own for almost 1 year, I decided to hunt for something which might do the job. I’m pretty sure there’s something out there. At first, it would seem that the only option available is slow cooker. Personally, I am not a fan of slow cooker. 1) it takes forever to cook 2) there’s limited pot size. 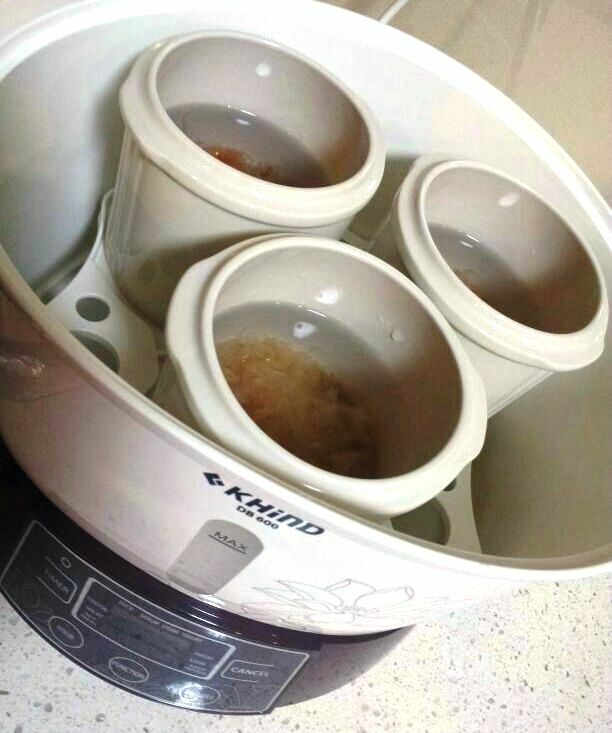 So when I found an electronic double boiler by Khind, I was so excited!!! It comes in 2 pot sizes (One big pot and 3 smaller pots). For my first experiment, I made the bitter gourd soup. First, I clean the chicken breast and pork bones and rinse it with some boiling water. After that, I carefully place the meat at the very bottom of the pot. I chopped one medium size bitter gourd and one carrot. Slot in 4-5 slices of ginger. Fill up the pot with boiling water (leaving a gap of 1 inch from the lid). Place the pot into the double boiler. Fill to the max line of the double boiler with normal water. There’s a soup function for 2 hours. But, I decided to use the slow double boil for 2 and half hour. The result – BEAUTIFUL. The soup was nice and clear. The bitter gourd is really soft but still in one piece. 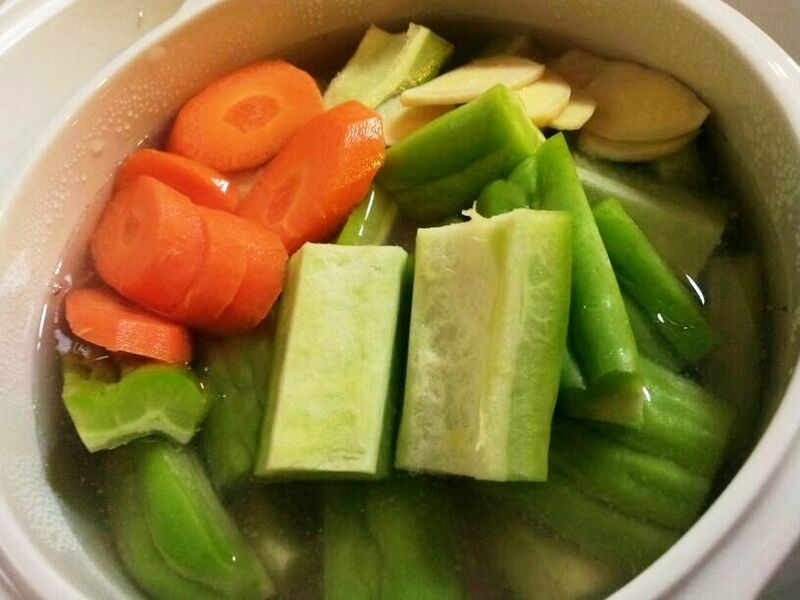 Sometimes, when you boil over the stove, the vegetable breaks into pieces. I’ve also experimented with the smaller pots. This time, I did bird’s nest soup. 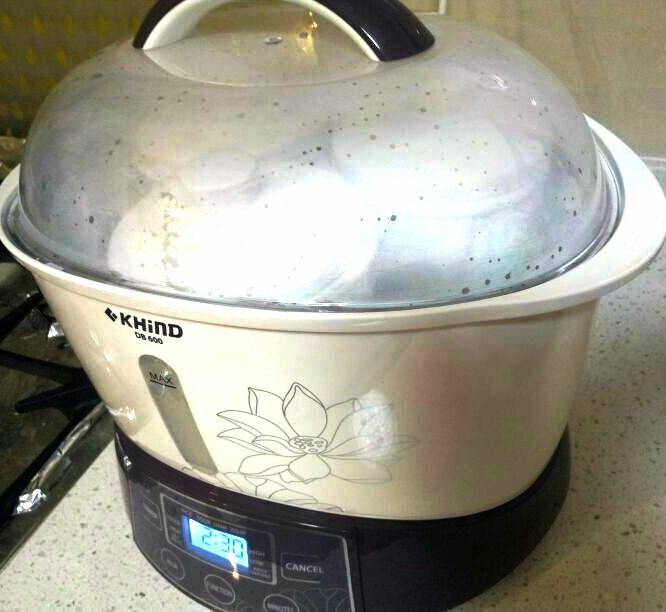 Hello!was googling for khind double boiler and came to your page!i got the double boiler about a month ago wanting to make chicken essence n soup using this.but guess what,i dare not make a first try coz i couldn’t get any tips on how it will turn out coz like you mentioned..no reviews!hahahahah!now after reading yours,i think i can try it tomorrow already after getting the ingredients!thanks for the first review!! Be careful to make sure you fill the ceramic pot more than halfway. When the ceramic pot is on the light side, it starts jumping a bit when the water outside starts bubbling… hahaha. I have only use the slow function till date. So, I’m not sure how the other function perform. Hi, this khind have the timer function? i plan to cook in the morning before going to work, and when i reach home there is soup. Can this be done? Thx! Yes – I think it has a delay timer function…So, you should be able to adjust when you want it to start cooking. But, I have not use it before. Usually I set it to start cooking before I leave. By the time I am home, the soup is done and the machine has a ‘keep warm’ function. Hi, Just wan2 ask, is the keep warm function start automatically after you finish the cooking? or do you need to press something?? Hmm… yes, I think so. But, I’m not sure if the keep warm is on forever until you switch it off or it automatically shut off after some time. I hv never leave it on keep warm function for more than 6-8 hours max. Hi, any idea what is the plastic material? Is it PP?? But, I am quite sure it is similar material as the electric water kettle. Hi Elaine. Thanks for the update. 🙂 will definitely check it out when i have time. Hi chuletz, I just bought the same boiler, when u add in water, are using hot or cold water? I’m still searching.. I use normal filtered water (cold).